Allan James is Distinguished Professor Emeritus of Geography (2018-present), Professor (2007-2018), Associate professor (1993-2006), and Assistant Professor (1988-1993) at the University of South Carolina, USA. He received a Ph.D. in Geography and in Geology from the University of Wisconsin, Madison in 1988, a masters in Geography (1983) and a masters in Water Resources Management (1981) from the University of Wisconsin, Madison, and a B.A. in Geography from the University of California, Berkeley (1978). He has authored six books and 50 refereed journal articles or chapters plus a large number of articles, reviews, chapters, and non-refereed papers. Dr. James was elected and served as secretary-treasurer (1995) and chair (1996) of the Geomorphology Specialty Group (GSG) of the American Association of Geographers (AAG), as Panelist (2006-2007) in the Quaternary Geology and Geomorphology Division of the Geological Society of America. 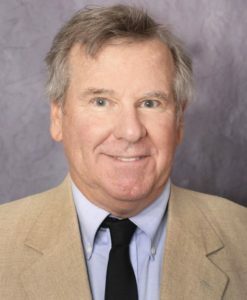 He received the G. K. Gilbert Award for Excellence in Geomorphological Research from the GSG in 2015, the Distinguished Career Award in Water Resources from the Water Resources Specialty Group of the AAG in 2018, and the Lifetime Achievement Award from the Southeastern Division of the AAG in 2018. He has served on the editorial board of Geomorphology since 2004. His research is primarily focused on fluvial geomorphology with emphases on river sedimentation, floodplain and channel morphogenesis following human activities, interactions between alluvium and flooding, and the use of spatial analysis in geomorphology. Specific themes of his research have included investigations of hydraulic mining sediment in California, historical erosion by rills and gullies and floodplain sedimentation in the southeastern Piedmont (USA), concepts of legacy (anthropogenic) sediment, Quaternary glaciations of the northwestern Sierra Nevada, California, geomorphometry, and geomorphic change detection with DEMs of difference.